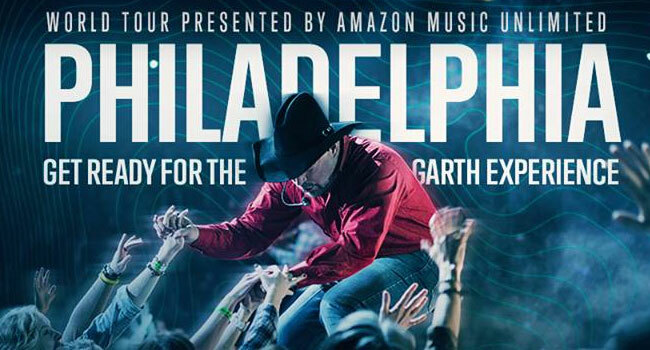 Due to extraordinary fan support, Garth Brooks has added a fourth and final another concert in Philadelphia. The tour is presented by Amazon Music Unlimited. The new concert will be Sunday, March 26th at 7 pm at Wells Fargo Center. Tickets for the new concert will be on sale Thursday, February 16th at 10 am EST. There will be an eight ticket limit per purchase. Tickets can only be purchased at WellsFargoCenterPhilly.com/Garth or 1-844-442-7842. Please note there will be no ticket sales at the venue box office on February 16th. Tickets will cost $62.36 plus a $3.12 tax, a $4 facility fee and a $5.50 service charge for a total of $74.98. All seats sold are best available.